When the garage door springs become damaged, the door may start having problems opening and closing. Rattling may occur and strange sounds may come out of the door when it operates. Torsion and extension springs are parts you should never attempt to troubleshoot problems with yourself. They are very dangerous when they snap and there have been many cases where people have gotten themselves hurt while attempting to perform do it yourself repairs on these parts. 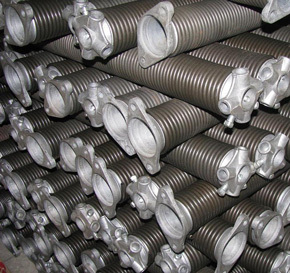 In most cases, property damage is also quite extensive when springs snap. Why wait until something like this happens? Why let the damaged springs cause damage to other parts of the door? It will only cost you more to wait to fix everything in a few weeks. Get the problem solved today by calling Hayward Garage Door Services. We offer same day service and also have a 24/7 service for emergency situations. Our experienced team can fix any kind of problem with your garage door. Also, we are the friendliest company around – we can give you all the information you need about your springs in case you need to buy a new pair. Fixing torsion and extension springs has never been easier. All you have to do is contact us, tell us more about your problem, and wait for our team. We are very flexible so we can surely find a time to meet with you. We offer free consultations and price quotes. Our team is also able to perform the repairs quickly because each one of our technicians is well trained and uses the most up to date tools. We’re the best for spring repair in Hayward! Here at Hayward Garage Door Services, we can’t wait to hear from you. We have years of experience in this field and are the best in the industry. Don’t wait until the springs snap and cause a lot of damage – expensive damage. Call today and let us repair them. We can assure you that you will be satisfied with the quality of our work, and with our rates.